It’s Christmas and your turn to play chef. If you have more than ten family members coming then you better start preparing the feast. Here are some helpful tips when you have to cater for a large and hungry family at Christmas. If the numbers are large you will need an extended visit to the local supermarket. It's not that you need more ingredients and items you just need to make sure that the quantities of these selected meals are going to be large enough to feed everyone. This might be a daunting prospect. The first consideration should be given to the turkey. Before you buy the biggest one that the butcher has on display, think. How big is your oven? This might sound like a simple question but many a caterer has been caught out at Christmas by buying a bird bigger than the oven itself. Buy a turkey that will fit and play it safe by purchasing a couple of turkey breasts, in the event that there is not enough to go round. Potatoes, vegetables and drinks need to be brought in bulk. Try not to skimp here. These are often the items that people will want seconds of. Pounds of carrots, potatoes and Brussels sprouts to peel are going to require assistance. Rope the kids and husband or wife in to help on Christmas Eve. Preparation and planning are your new key words that will help you over the next few days! If your shopping bill is reaching triple figures don’t be afraid to cut back on a starter course. This won't look cheap and your guests may even be grateful! Remember that December is one long month of indulging! A few simple crudités, warm pitta breads and dips, laid out in the lounge area of your home, will be more than enough to whet their appetites for the main course! Anyone who has ever cooked a Christmas dinner will know that getting everything on the table at the right time is a small feat requiring precision planning and hours of toil. You don’t have to go it alone. This a time of year for families to unite and so don’t feel awkward about asking for help. Prompt those guests to bring a dish with them. It doesn’t have to be especially festive. Their favourite dessert or a savoury side dish that can be heated up in the microwave will be hugely helpful. It will get them more involved in the meal and eases those stress-levels for you. With everyone’s help you can guarantee that there will be plenty to go round. Getting assistance with the food is one thing but don’t forget to ask for seating help. Each guest should have a chair to sit on and if you think that supply is going to fall short of the demand, call on your relatives. This rule can apply to wine, glasses, serving plates and anything else that you need to ensure that everyone is catered for. As well as serving up a sumptuous banquet for everyone to enjoy there are other added extras that should not escape your attention. Make sure that you have enough of those festive crackers to go round; one per person is enough. 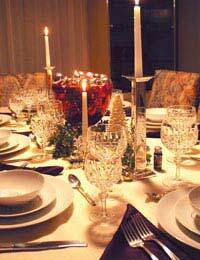 When you lay the table, place a small favour at each place setting. A small packet of gold chocolate coins is one safe option. Alternatively, you can be a bit more creative and personalise each setting. Get a small gift for each person – something which summarises their personality – and let them guess where their dedicated seat is meant to be! If you have a large family coming this might require some serious planning and thought so get cracking right away! Preparation is the key. Corners are going to have to be cut. Get microwaveable side dishes, pre-made roast potatoes and all the help you can muster. If it’s a group effort you will certainly be able to pull it off and have yourself a very merry Christmas indeed!